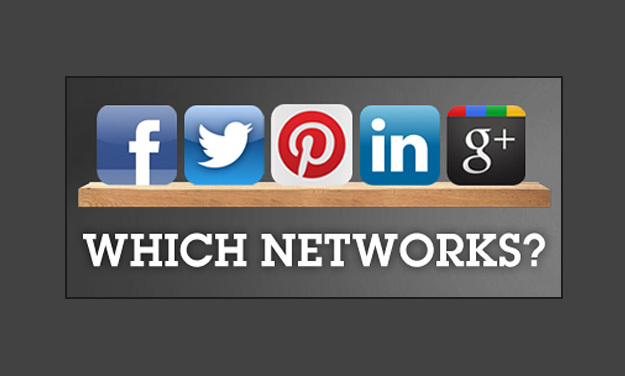 Which Social Networks for Your Business? Social media has very quickly become a hugely important part of doing business online and its influence on consumers continues to grow by the day. Not only does it provide a direct communication channel between businesses and consumers, a largely free way to spread brand message and a way to build a community around a brand, social signals are becoming an increasingly important factor in search engine rankings. If you have the time and resources at hand it could be that getting involved in all of the major social networks could be great for your business, but putting all your eggs in one basket right away can often lead to failure so slow and choose your networks wisely. Facebook With over 1 billion users (the majority of whom are active) Facebook is the world’s largest online social network. Not only does it provide a platform to connect with friends and family, it also provides a very personal way to interact with customers and communicate your business message. Building a community on Facebook will create buzz around your brand and ultimately drive traffic to your site. Facebook marketing can be hugely successful, especially for consumer targeted brands. Building a relationship with consumers through good conversation, competitions and other promotions can lead to many new and returning customers. Facebook also has a “promoted posts” feature which allows brands to push out their content to friends of existing customers. Media rich posts are the best for Facebook with image and video posts seeing far more interaction than standard text updates. Google+ As a business, Google+ is a very important social network to be part of for a number of reasons. Since it launched in 2011 it has gained over 500 million users around a third of which actively use the social stream. More importantly, being a Google product it is heavily integrated with Google search and as such has an impact on search engine rankings. Some level of Google+ use is vital for both social media and SEO campaigns. Google+ usage is particularly important for local businesses due to tight integration with Google Places. Where your business appears in Google Places listings can be heavily influenced by Google+ factors such as user ratings and reviews which can easily be left through the service. LinkedIn LinkedIn is a far more professional targeted social network than the others. For personal users it is a way to connect with other professionals in their field of expertise and has been a bit of a recruitment hotspot. For businesses it allows a showcase of products and services and an opportunity to connect with other business and potential customers. LinkedIn should in most cases be the network of choice for B2B companies. LinkedIn is primarily a great place to share company and industry news but it has a lot more to offer. The groups feature of LinkedIn allows conversations and relationships to form with like minded individuals and other companies, often leading to new business. Q&A sessions are also common on LinkedIn and a great way to share your expertise. Encouraging your employees to take part in these groups and discussions can really show off what your company has to offer. Twitter Twitter is often categorised differently to the other major social networks; it is known as a ‘microblogging platform’. The only real function of the service is allowing users to share messages up to 140 characters in length with their ‘followers’. This makes it a great outlet for content sharing and promotional messages for businesses and updates are usually sent out far more often than on other services like Facebook. News is perhaps the most heavily shared type of content with stories all around the world breaking on Twitter before even major news networks report on them. The more impersonal nature of Twitter makes it perfect for pushing products and services to customers. It’s very important however to also post plenty of other interesting and informative content to keep users interested and gain new followers. Retweeting content from other users will show your involvement in the community and interacting with particularly influential users will increase your follower base and give great return on investment in no time. Pinterest Although running a closed beta from as far back as 2010, Pinterest is still the new kid on the block. Presented in the style of a pinboard, the image sharing site quickly gained popularity becoming the third social network in the US ahead of LinkedIn. Businesses can leverage the popularity of the site by “pinning” images of products linking back to the product page on their site. The site is largely populated by women users which has driven wedding products, make-up, jewellery and home design inspiration regular to the top page. YouTube YouTube was acquired by Google in 2006 for $1.6 billion, just a year after its creation. Since then it has become the third most trafficked site on the web after Google and Facebook. Actively pursuing YouTube as a marketing channel can be far more expensive and time consuming than other social networks but it is possible to reap the benefits. How-to videos or product reviews can rack up hundreds or even thousands of views and drive relevant traffic to your website. If actually posting videos to the site isn’t feasible for your business there are other ways you can capitalise on the popularity of YouTube. Sending free products to popular YouTube users and requesting a review can be a great way to get your brand out there. Popular YouTubers can get hundreds of thousands of views on every video posted so an endorsement from them could potentially send a huge amount of new customers your way. Whichever social network or combination of networks you decide is best for your business, you must commit to it and keep trying. Social success doesn’t come overnight, you must remain active and attentive to your audience but in the end you will reap the rewards.